1. 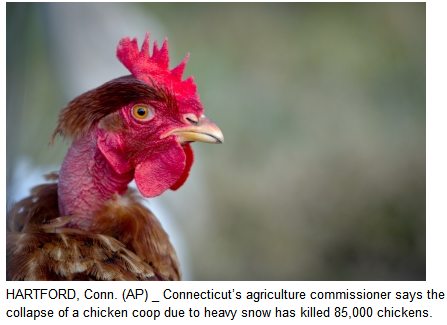 The “Chicken Little and I told you so” award to the farmer in Hartford, CT. who lost 85,000 chickens when the roof of the chicken coop caved in due to heavy snow accumulation. Maybe next time you’ll take my blogs more seriously ( http://wwwcvillean.blogspot.com/2011/01/was-chicken-little-prescient.html ). 2.The “my office is always open” award to an insurance agent in Tampa, Fl. One of his clients was driving along, suddenly swerved off the road, jumped the curb and crashed into the building where her insurance agent was working. The woman client, who was uninjured, was heard to say after the accident, “Could you take care of this claim right away? I’m late for Pilates”. 3.The “You can never get a taxi in this damn town” award to the 26-year-old man who was arrested in San Pablo, Calif. and accused of stealing a taxi after tricking the driver into momentarily exiting the cab. The man then drove to a Department of Motor Vehicles office, where he attempted to register ownership of the car. Guess he just got tired of trying to flag one down. 4. The “You should have seen the one that got away” award to the ice fishermen in Minnesota. While ice fishing through the hole they snagged “the biggest one they ever saw”, but it turned out to be a scuba diver who had been diving with 2 friends and had entered the lake through a hole further down the ice. I hate it when that happens, don’t you? 5. The “Sorry I missed your call honey, my phone was on charge” award to Cody Wilkins of Silver Spring, MD who, while burglarizing a house, was surprised by the homeowner and jumped out a window to flee the scene. Only problem was, he left his cell phone which he had plugged into a wall outlet to charge while he was busy stealing. Of course, the police tracked him down and he is now charged with other burglaries in the area. It just goes to prove that old adage “you can’t take it with you” (at least not while it’s charging). 6. The “This is why the government is trying to ban smoking in your own home” award to the tenants in Portland, OR who started a house fire when they began using a hole in the floor as an ashtray. The fire caused $30,000.00 in damage. The tenants refused to comment to reporters, claiming they were late for a Mensa meeting downtown. 7. The “I was only kidding, can’t you take a joke”? award to Robert Michelson of Connecticut who, not being right up to snuff on the drug laws, called 911 to ask how much trouble he could get into for growing one marijuana plant. When told he could be arrested he said thank you and hung up. Unfortunately for Robert, he had used his home phone. The police went to his residence and sure enough he had a marijuana plant. Apparently Robert had never heard the old proverb “it’s easier to get forgiveness than permission”. 8. Thieves in Malaysia stole 1.5 million dollars worth of condoms manufactured by a large Japanese firm. When questioned about the theft, the company said there were 725,000 condoms in the shipment. As an added note, investigative reporters later learned that the shipment was on it’s way to a Charlie Sheen in Malibu, CA. My thanks again to all the above folks who provide fodder for the “They did what”? blog series, proving yet again that truth is stranger than fiction.